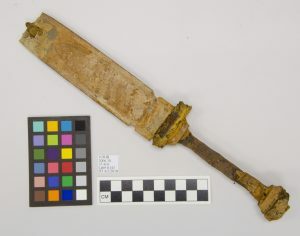 Conserving this artifact, a bayonet (shown here in its scabbard), will enable VDMA to exhibit it, tell about its history, and how it came into the Fort Lee museum’s collections. One of among a network of archaeological labs in Virginia, DHR’s Conservation Lab in Richmond offers its services to museums and other venues in the Commonwealth, as time, staffing, and funding allow. In 2018 Christopher Parr, archaeologist and collections manager for the Virginia Department of Military Affairs (VDMA), visited the DHR Lab to ask me—since I am DHR’s conservator—about the best way to store a World War II bayonet. Chris mentioned, while I examined it, that the scabbard was fiberglass. For a conservator looking for a new thrill, artifacts from the recent past, the 20th century in particular, represent an opportunity to learn about best practices for conserving modern materials. Relatively recently fiberglass has started to enter the archaeological record and conservation labs. Mass production of it began in the 1930s and was in full swing by the outbreak of World War II in 1941. That means it is relatively rare to see fiberglass in a lab today, but more of it is on the way—so long as archaeology is practiced! I had a new challenge. I offered to treat the artifact pro bono—in return VDMA would get a conserved bayonet and DHR would get a chance to learn about the conservation of fiberglass. So I submitted a treatment proposal, and VDMA approved it. The bayonet removed from its scabbard reveals its overall poor condition prior to beginning conservation efforts. Both VDMA and DHR love this artifact—in part, because of its origins. It is a terrific example of a contractor finding an artifact and handing it over instead of pocketing it. This gives VDMA the opportunity for further study, conservation, research, and public education. Archaeologists, historians, and many others want to encourage such behavior so we can better preserve Virginia’s and our nation’s history for the public. 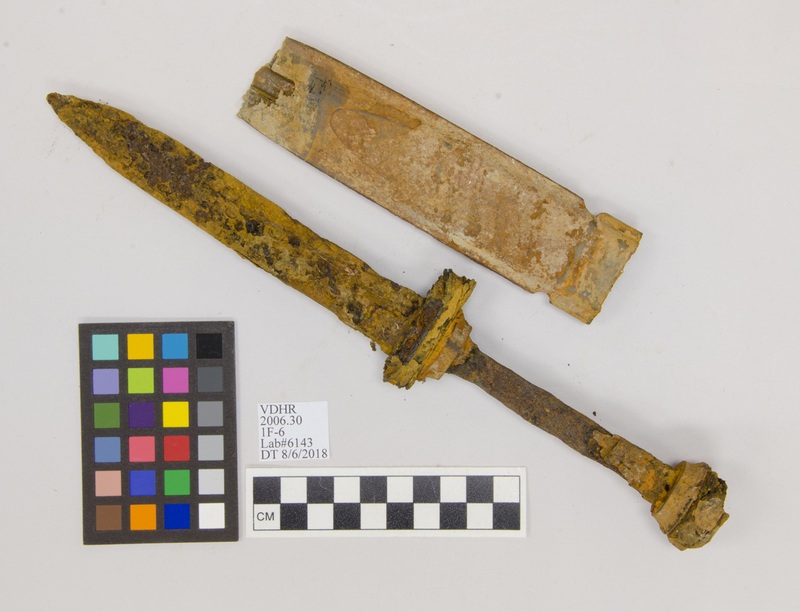 My first step was to determine that the artifact was, indeed, a bayonet, not a knife. It had been buried many years, and corrosion made it a bit unclear—although Chris Parr remained confident it was a bayonet. To help assess it, I decided to x-ray it. Meanwhile, Chris passed along specs for several knives and bayonets that were provided by Mr. James Blankenship, the Director of the Ordnance Training and Heritage Center at Fort Lee, to help identify the artifact. X-ray and visual examination determined it to be a No1. M4 carbine bayonet, with an M8 scabbard. The location of the pin in the handle, and the shapes of the blade, the flanges of the scabbard (especially), and the hilt all contributed to the identification. This X-ray plate indicates the extent of corrosion and helps to guide conservation efforts. Note the blade is in better condition than the hilt. 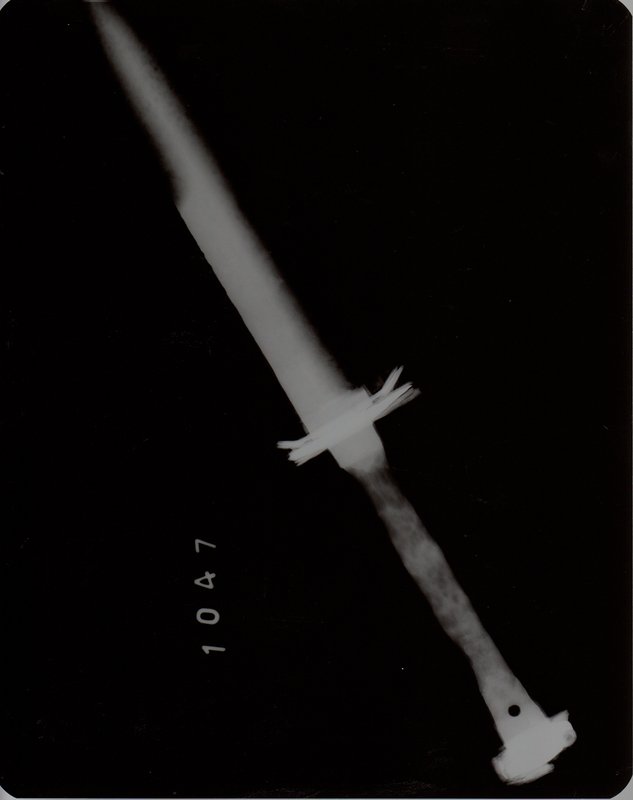 The x-ray helped with identification but also gave insight into the level of preservation of the artifact. When looking at an x-ray of an iron object, bright white parts generally indicate better preservation of the metal, and gray or black indicate worse preservation or holes and losses. Notice in the x-ray, the blade is in much better condition than the handle. The fiberglass scabbard may have helped preserve the blade during burial. The conservation process for the bayonet will likely take a long time. DHR will keep you updated on its progress. We will definitely post about it once the project is complete so you can see the final results—and we can share what DHR learns about conserving fiberglass.